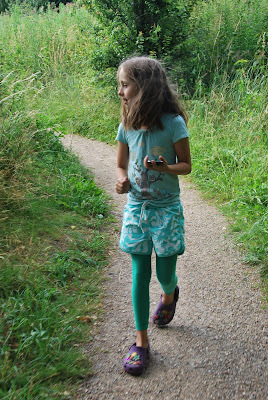 because we are the parents of the hippest, coolest 8-year-old on the planet (or at least in denmark), we learned this week about geocaching (from her, of course). and today, we found (through the aid of my beloved iPhone, which husband refers to as the clever phone) our very first treasure. right here in our own neighborhood. the treasure is a container of some sort. leaving a treasure behind and taking one. tho' there were other items. we also brought a pen so we could write in the logbook. then we filed a field note. so other treasure hunters could benefit from our search. just don't let the muggles see you looking. then everyone will want to play. Oh how brilliant! There are a few around here, I'm not sure my boys are old enough to understand the concept but worth a go. Thx for the tip! Oh those Apple mavens are clever, very clever indeed. Soon we'll be using our phones for everything but talking to each other. I like this particular bit of genius because it gets the kids out of the house. What a fun, techno-savvy update of the treasure hunt -- with a bit of message-in-the-bottle mystery thrown in! And I love Sabin's outfit as well. Welcome! 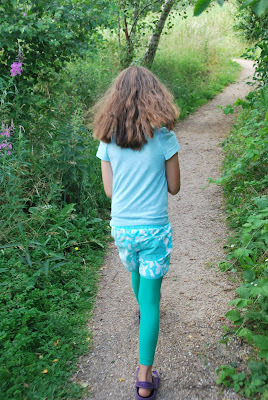 We have geocached with & without kids for the last 2 or 3 years & the kids make it way more fun. After we began doing this, I realized we had inadvertently muggled a cache a couple of years earlier. Uh oh. I never heard about this before until you tweeted about it. I'm so going to do this if i ever receive my iPhone! one of my friends does this with her daughter and LOVES it. Another friend urges me to try it...maybe when the niece gets a bit older. One more reason to really get that iPhone. Although, I think I'm seriously kidding myself if I think I'm ever leaving the house again. Yup. One of those days. Glad though that you're having fun! I need to do this! Another reason to love my iPhone! I'm in love, yes! i know several people who "hunt." I've never tried, altho i love the idea! way cool. We've done this even here in deepest darkest GA... the girls LOVE it.... way too cool!!! o0o I wish I had a clever phone now.